If a tree is dead, has been uprooted, or has fallen, it may need to be removed. Small trees can sometimes be removed in a single section, then cut into smaller pieces to be hauled away. Large trees may require the use of a crane and need to be removed in sections. Professional tree removers take care to protect the surrounding area from falling debris. 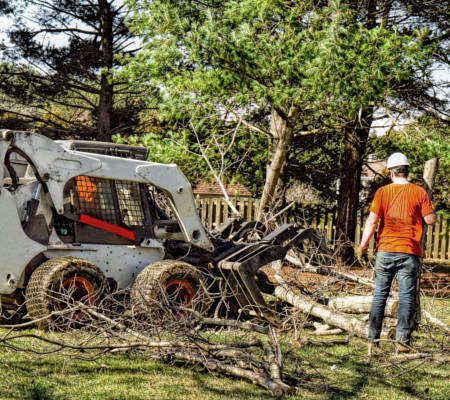 Tree removal generally includes hauling away and disposing of the tree sections. Some tree removal services may be available 24 hours for emergency removal. Cutting down a tree is the easy part. Then there’s the stump to deal with. A tree stump may be in the way, it may be a hazard, or it may just be unattractive. 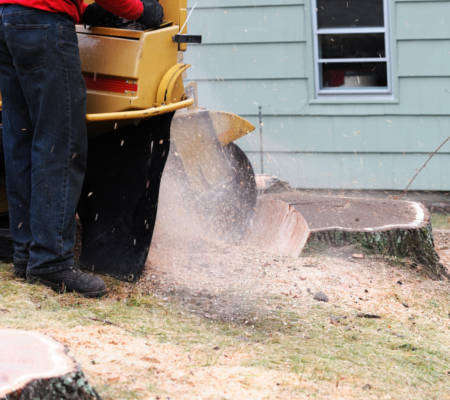 A homeowner can choose between having a stump ground down or having it removed with chemicals. Stump grinders are dangerous equipment, but can get the job done in about an hour. Chemical stump removers are more economical, but take much longer time. Potassium nitrate is the most widely used chemical stump killer, but all are hazardous to use. These remain dangerous to children and animals for weeks. Pruning benefits trees and shrubs in a variety of ways. Limbs may be removed to enhance the forms of young trees or guide the shapes of shrubs as they grow. 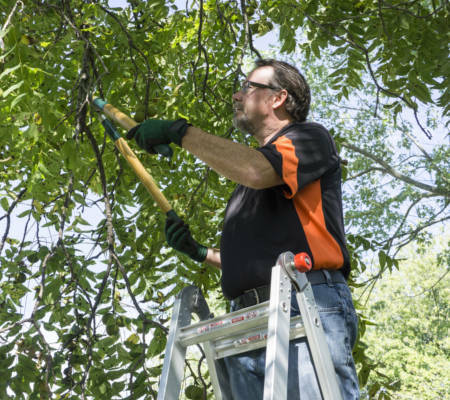 Branches can be trimmed to aid growth of fruit trees, thin the canopy of more mature trees, and to improve the view of what’s behind them. Limbs may be cut because they are diseased or dead, or to prevent damage from storm winds. Cutting or trimming branches can also improve appearance. 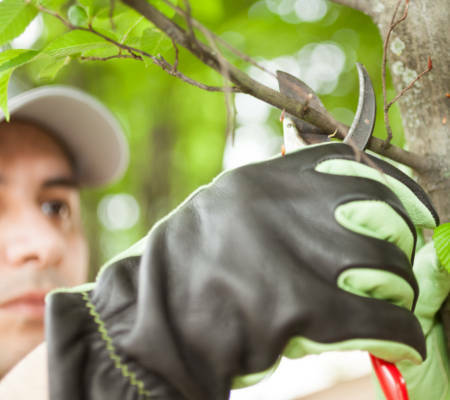 In any case, a certified arborist will prune to maintain the health of trees and shrubs. Consulting with a tree doctor can be important in keeping trees healthy. It’s wise to find a certified specialist if trees appear to be sick or damaged. Upon inspection, a tree surgeon will be able to diagnose diseases and recommend treatments. Arborist services may include spraying insecticide or fungicide. 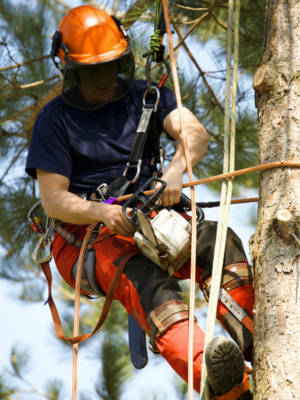 A tree surgeon may also repair surface wounds, such as broken limbs or scraped bark. Cabling and bracing may be recommended in the case of structural issues, such as splitting or cracking trunks or branches. Both planting and moving trees are stressful ventures, and timing is important. Young trees have different planting requirements depending on the type of tree and the time of year. Deciduous trees are best moved in early spring or early fall, while evergreens fare better if moved in late summer. Even small trees require a root ball containing several hundred pounds of soil, and need to be placed into a hole at least three times as wide. Commercial tree movers will be able to advise as to the best time and method for transplanting mature trees for the best results. Pruned limbs and felled trees can all have a second life after being sent through a woodchipper. The resulting wood chips can be used for mulching the landscape or garden on the property. Wood chips are an environmentally friendly and cost-effective material, and an attractive alternative to chemical fertilizers and synthetic weed barriers. Mulching with wood chips helps conserve water, prevent soil erosion, and improve the soil. Tree care providers may complete wood chipping onsite or take away larger pieces to be chipped. Trees add value to a property as well as visual appeal. But unhealthy trees can be downright dangerous. Without strong roots and branches, trees can lose limbs or be uprooted by high winds. The health and maintenance of trees is a vital investment. Tree care is a local matter. Find a licensed expert in your area who provides services recommended for the types of trees, bushes, and shrubs that grow on your property. Whether you have pines or palm trees, oaks or maples, your local arborist will know about pruning and fertilizing, storm preparation, and what pests and diseases to look out for. We’re here to help you find the best quality service. Our directory offers reviews of tree care companies proven to provide superior service at affordable rates. For residential or commercial property, if you need a reliable contractor, we’ve got you covered. What is average cost of tree removal service? What is average cost of tree trimming service? What is average cost of tree stump removal service? What is average cost of tree cutting service? What is average cost of tree pruning service? What is average cost of certified arborist service?